Local dentist or Access Smile? Sometimes a local dentist seems able to offer the "same price". It sounds great, but it is not always true! Over the 9 years since we started our service we have not once seen a like-for-like quote that came close to what we can offer in Budapest. using cheaper quality material - avoid inadequate implants, poor quality veneers or crowns with no guarantees. Initial prices shown on websites are not everything. If you are not careful, what seems to be the cheapest treatment can end up being the most expensive. Our patient journey ensures that you get the best treatment for your specific needs and at a great value price. Our handholding approach ensures that we are with you every step of the way – we help you make the right choices at the beginning, we organise your stay in Budapest and of course provide excellent dental services and aftercare. You can contact us via this website, by phone (Ireland : 1850 493493, UK : 020 7183 5205) or by email: info@access-smile.ie, info@access-smile.co.uk. One of our treatment consultants will call you back to discuss what you need and advise on the best way forward. She will answer your questions and send you extra information. She will also organise you getting a quotation. She will remain your main contact until you are ready to start treatment. Organising a personal assessment and consultation in Dublin. This is allows for the most detailed assessment, including a thorough dental examination and a discussion about your needs. Getting a plan through the Budapest Clinic based on your X-ray and all other information you provide. This is ideal for those who live further away from Dublin and don't want to travel. In the UK, we can help you book an X-ray at several locations to minimise travel. Helping you organise a consultation visit to Budapest. The advantage is that you can see the facilities, meet the staff, even meet clients already there. After receiving your quotes, your treatment consultant will help decide which one to go for and also arrange booking your treatment. 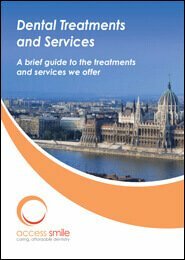 Your treatments will be booked by one of our experienced patient coordinators in Budapest. This includes all your clinic visits, advise on hotels, arranging transfers, answering questions. They will also send you all the information you might need – on tratments, guarantee, payment terms. Once the clinical appointments are finalised, you will need to let us know your flight details and we will book your hotel and arrange transport. You don't have to be an experienced traveller to undertake the journey and Budapest is safe even for single female patients. Appointments will be given with your optimum comfort in mind. Our highly skilled dentists and assistants will inform you of every step, discuss any question you might have and you can even ask for last-minute changes. We will make sure that you are comfortable throughout. Between clinical appointments you will have the opportunity to enjoy Budapest and its many attractions – make the most of it! With multiple-stage treatments, you can opt to have some parts of it in Dublin, allowing even more flexiblity. Just like cars, teeth need regular "servicing" to continue to function properly. During the guarantee period, we ask you to attend 6-monthly checkups with cleaning at one of the clinics authorised by Access Smile. This way we can spot and fix any problem early. Though it will be your responsibility to book these appointments, we will send you reminders to make it easier to remember. In the unlikely event of any such problem, we will most likely be able to remedy the issue in Ireland or in the UK. In the very few cases when this is not possible, we will fly you back to Budapest and cover the cost of both flight and accomodation. After the guarantee period, we still recommend to maintain the 6-monthly check and clean routine to ensure that the new teeth last a long time.